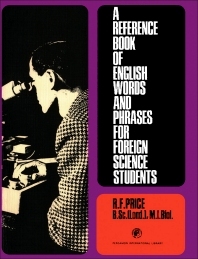 A Reference Book of English Words and Phrases for Foreign Science Students is a reference book of English words and phrases for foreign students, to be used as an aid when reading books on science, making notes, or when describing experiments. It is intended to teach the non-technical English words and phrases which are necessary to describe and explain things and events scientifically. Instructions on how to use the book are included. Comprised of eight chapters, this book begins by introducing the reader to qualities of things (shape, composition, texture, color, taste and smell). Subsequent chapters focus on relations (quantitative relations and size, spatial relations and order, temporal relations, whole and part); actions (change, motion, techniques and use of apparatus); facts, concepts, and problems in science; the scientific method; causation and classification; and the particular, the general, and comparisons. This monograph is intended for foreign students who wish to write clear, concise English and to understand more clearly the methods used by scientists in solving problems.